Barbera, Piedmont’s most widely planted variety, finds ideal climate in the vineyards surrounding the Bricco dei Guazzi property: perfect for fostering the ripening process which gives the wine its renowned qualities of food-friendly acidity, great character and optimal intensity. 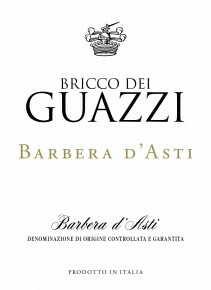 Bricco dei Guazzi Barbera is deep ruby red in color with purple hues. There are warm, fruity aromas on the nose with hints of red berries and jam. The palate is round and full with silky tannins and a slightly spicy finish. Pairs well with most meat dishes, from grilled steak to pork chops. Very versatile it is also great with hearty pastas and soups as well as pizza. Barbera d’Asti is one of the most famous wines from Piedmont, covering the area around the towns of Asti and Alessandria. It became a DOC in 1970 and was upgraded to DOCG status in 2008. Softer and more approachable in its youth than Nebbiolo, Barbera is a firm favorite among winemakers and consumers. It is alsothe region’s most widely planted red-wine variety. Fermentation on the skins takes place in large stainless steel vats and lasts one week. Frequent pumping overs allow for optimal color extraction and good body. After malolactic fermentation is complete, the wine is placed in 30 hl barrels for 6 months, and then it rests in bottle for 4 months.